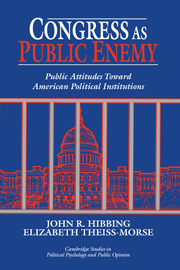 This timely book describes and explains the American people's alleged hatred of their own branch of government, the U.S. Congress. Focus group sessions held across the country and a specially designed national survey indicate that much of the negativity is generated by popular perceptions of the processes of governing visible in Congress. But Hibbing and Theiss-Morse conclude that the public's unwitting desire to reform democracy out of a democratic legislature is a cure more dangerous than the disease. List of figures; List of tables; Preface; 1. Introduction: what is wrong with the American political system? ; 2. Changing levels of support for individual institutions; 3. Perceptions of political institutions; 4. Perceptions of congressional features and reforms; 5. Focus groups and perceptions of the Washington system; 6. Who approves of congress? ; 7. Support for democratic processes; 8. Conclusion: the people and their political system; Appendix; References; Index.